Here’s an email I received from a longtime customer about his hot tub water care. The sad part? He’s suffered for 20 years with dry, itch skin after his nightly soak. What a dedicated hot tubber! A nightly soak despite dry skin!! I almost cried reading his email. Read what happened when he switched to SilkBalance and note how clear is water is in the photo. For 20 years I have owned a Hot Spring Spa, and for 20 years, I have put up with dry itchy skin after my nightly soak. Then I tried SilkBalance. The water really does feel silky and so does your skin. I was sold on SilkBalance after one soak. 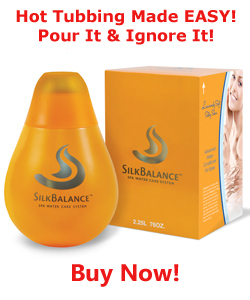 Once you try SilkBalance, you’ll be sold on it, too. Have you been suffering from dry skin after your nightly soak?! If that’s your story, change it now. 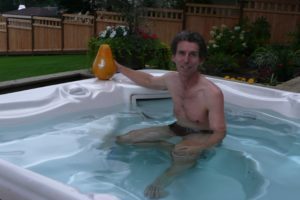 SilkBalance restores hot tubbing to fun again, and, like Gary says, once you try it you’ll be sold on it, too. What’s stopping you? With a 100% money back guarantee, there’s every reason for you to TRY IT!